A Union Bay Turkey Supporter. Lots of words but no plans. Again, someone believing Kensington Island Properties is going to solve all the financial obligations facing Union Bay. Why does she claim development (KIP) will reduce her taxes (property? ), parcel taxes and water fees? How is that going to work? If anything, our property taxes will increase with development – but has nothing to do with parcel taxes and water rates. How many houses a year does she believe KIP is going to build initially? 10, 50? Whatever the number or when, all developers must pay $8900. per hookup in Capital Expenditure Charges. It’s fantasy to think our parcel taxes and water tolls are going to decrease. They were kept low for years because of the thinking displayed by Jednorog believing the KIP development is going to save them money. Moving from Calgary and bitching about the parcel taxes and water tolls in Union Bay is pretty low. 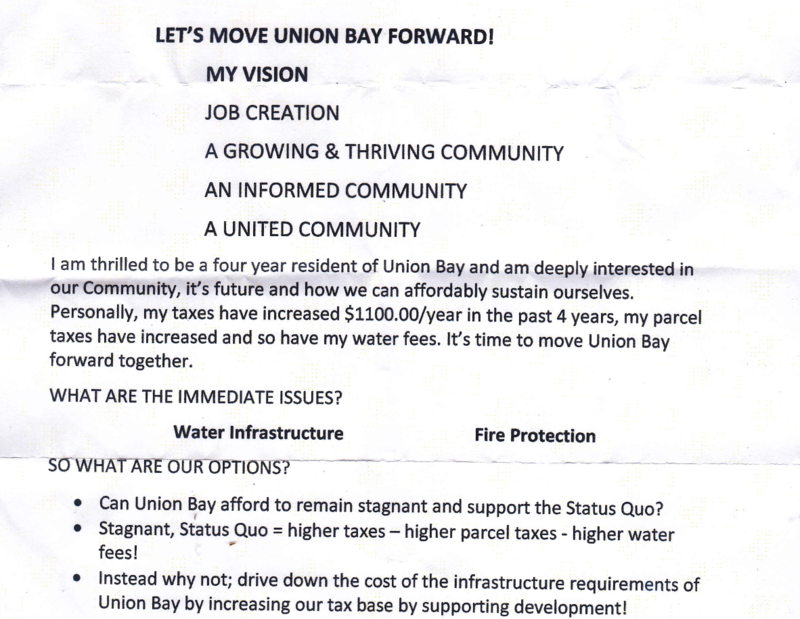 Where does Jednorog think the money comes from to operate the Union Bay Improvement District? Too bad Jednorog wasn’t a Union Bay landowner when her buddies now leading the Concerned Citizens group, unlawfully locked out the electorate while they secretly negotiated the 2011 Expired Water Infrastructure agreement. Would she have joined those of us who protested this action? From the flyer distributed by Jednorog below. Why is this worded with or without KIP? That is not the choice. If Kip is ever going to build a home it will pay $8900. per hookup – UBID will use the Capital Expenditure Charges to fund infrastructure costs. Trying to pass this off as though Union Bay would lose something if the expired agreement is not resurrected/extended is misleading. 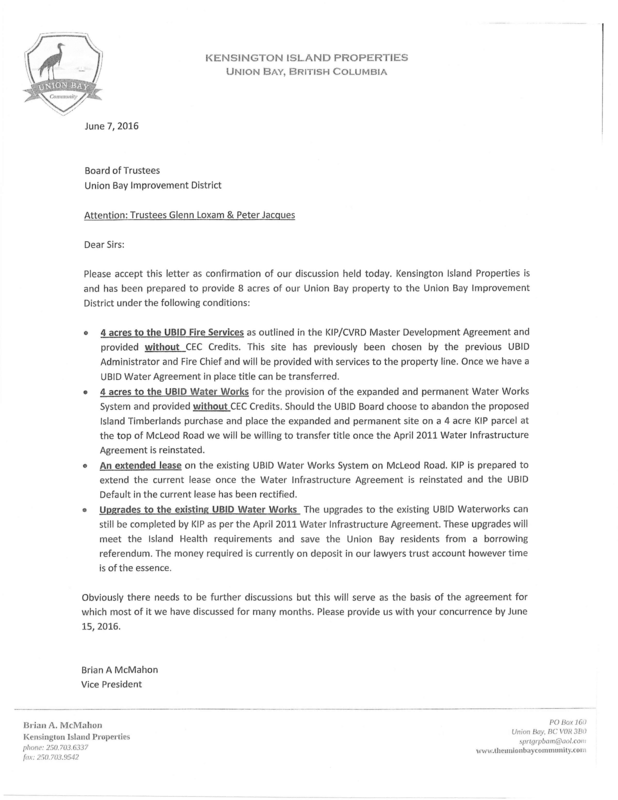 Whenever KIP reaches a new agreement it will pay those Development Expenditure Charges to UBID – there’s no money lost. KIP simply has to negotiate a new agreement. 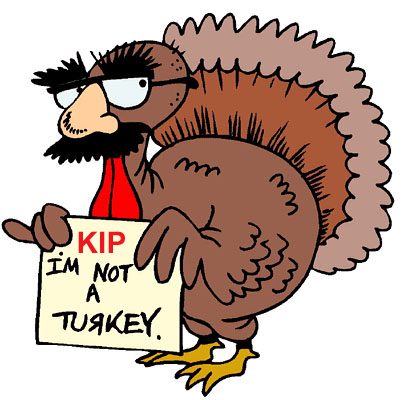 That’s what is required for KIP to move forward. For KIP to insist he wants to negotiate and at the same time insists he has an agreement is ridiculous and no one questions him on this. Just because it won’t be a temporary treatment plant on his land does not mean he won’t be paying Capital Expenditure Charges. For KIP to spin it by claiming either he pays or we pay is a sleazy thing to do. Anything he pays for is offset by credits towards Capital Expenditure Charges. By offering $1.2 (initially 1.9) to build a temporary water treatment facility is KIP stating how the Capital Expenditure Charges (paid up front) are spent. At least 66 % of landowners support the KIP development. But do they support a developer controlling and owning the treatment facility and the obvious flaws in the expired WIA? No timeline, Langley Lake and dam excluded. Larger tax base to support and build future infrastructure. Again, how many homes will be built in the next five, ten years? KIP told the audience at the March meeting he, and most of us would be dead before build out. Your costs for parcel taxes and water tolls are only going up, nothing is going to reduce them. You’re dreaming. Immediate water treatment plant and upgrades to major infrastructure funded by developer. Ya, another genius. Prove that bloody statement! Accessible land will be donated to UBID for a permanent water Treatment Plant by the developer. Is this the piece of land she’s referring to in an unsigned letter from the VP of Kensington Island Properties? Four acres (which is insufficient) at the same problem elevation as the existing waterworks? Ya, base a community’s future on unsigned letters. Vote for Jednorog to roll back to the days of incompetence and inflated egos who just about bankrupted the community. Jednorog was concerned early this year about the $20,000. extra on legal fees. Obviously, in the 4 years she’s lived here she hasn’t bothered to look back and appreciate the work it took to get us out of the financial mess left by the very people promoting the flawed 2011 WIA agreement. Was she concerned the legal costs alone to get us out of the white elephant of a school were $122,000? Add the cost of the upgrades, thousand in heating bills for 3 people, interest on mortgage for property we didn’t have clear title to, and it’s well over $300,000. lost money – our money. Already approved and accessible land will be donated for a new Fire Hall by the developer. This is in the MDA. The land won’t be donated until it is serviced. Won’t make any difference to Union Bay until that time and there is no indication when that area would be subdivided and serviced. Could be years. Employment opportunities as the community grows. Again, there aren’t going to be hundreds of homes built at once or even slated to start. KIP must have sewer and water before it can build one house. No sewer as far as anyone knows. No sewer – no homes. Beautification of shoreline and the downtown core of UB. WTF? Where is she getting her material? Telus to build a new cell tower for improved community reception. And that is relevant because…………. A beautiful new 18-hole golf course. Shrinking golf course from 27 hole. Again, when? No timeline ever offered by KIP has come and gone years ago. Do your homework. These are the same regurgitated promises that never materialize. A new marina and commercial waterfront properties. There has been no new applications for a marina since KIP was refused years ago. Kip claims there will be a 300 slip marina, where is the sewer? Will it have a sanitation station for all those boats? What about fuel? Will there be fuel for boats? A new school and a seniors’ housing facility proposed. Again, the school property is in the MDA between KIP and the CVRD. A school has to have kids – will be many years before there is a need for a school in Union Bay. Isn’t that how we bought the white elephant of a school? It was shut down because there weren’t enough kids. 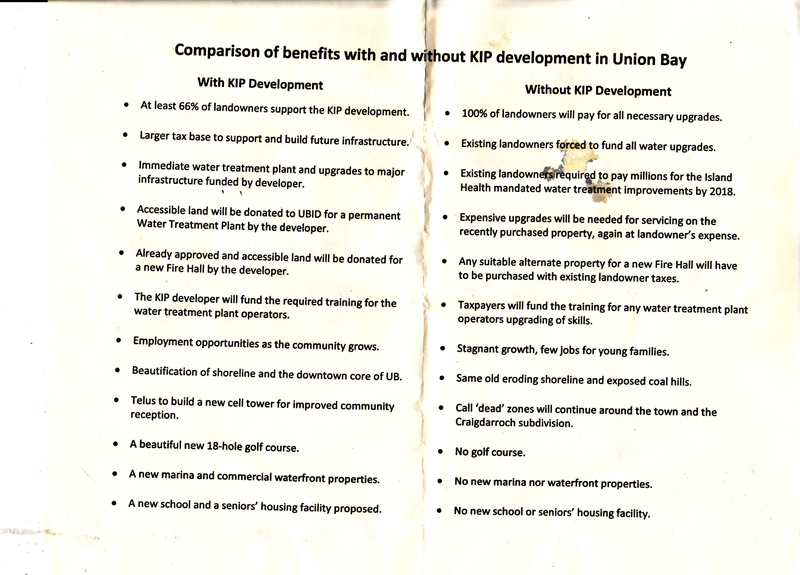 None of KIP’s property has been subdivided – nothing is going to happen in the near future to reduce costs to the landowners of Union Bay as this developer is a windbag full of empty promises and people like Jednorog lap it up. The key word is proposed seniors’ facility. If you pay attention to the VP of KIP he uses phrases such as, “we’re looking at” and “if we’re going to do it” none of which promised anything. It is a concept an idea. Nothing guaranteeing it will be a reality.